Exodus 2006 - The 23rd of May 2006, He judged! "We extensively discussed the Iranian issue," Olmert said. "There is a full understanding between the president and myself on how to deal with this matter." 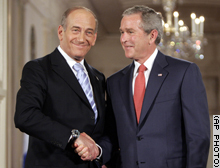 Olmert said he was "very satisfied" with the discussion he held with Bush on Iran. At those meetings, Olmert discussed with Bush Israel's plans for revising its timetable for setting final border arrangements with the Palestinians, putting those plans on the back burner while moving the Iranian nuclear program to the front burner. In effect, Olmert informed Bush that 2006 would be the year for stopping Iran's progress toward a nuclear bomb and 2007 would be the year for redrawing Israel's final borders. That schedule fit well with Bush's priorities, which may require some dramatic foreign policy success before the November congressional elections. At a joint press conference with Bush on May 23, Olmert said "this is a moment of truth" for addressing Iran's alleged ambitions to build a nuclear bomb. "The Iranian threat is not only a threat to Israel, it is a threat to the stability of the Middle East and the entire world," Olmert said. "The international community cannot tolerate a situation where a regime with a radical ideology and a long tradition of irresponsible conduct becomes a nuclear weapons state." Olmert also said he was prepared to give the Palestinians some time to accept Israel's conditions for renewed negotiations on West Bank borders, but - if Palestinian officials didn't comply - Israel was prepared to act unilaterally. The prime minister said Israel would "remove most of the [West Bank] settlements which are not part of the major Israeli population centers in Judea and Samaria. The settlements within the population centers would remain under Israeli control and become part of the state of Israel, as part of the final status agreement." In other words, Israel would annex some of the most desirable parts of the West Bank regardless of Palestinian objections. That meant the Israelis would need to soften up Hamas, the Islamic militants who won the last Palestinian elections, and their supporters in the Islamic world - especially Hezbollah, Syria and Iran. In a speech to a joint session of Congress, Olmert added that the possibility of Iran building a nuclear weapon was "an existential threat" to Israel, meaning that Israel believed its very existence was in danger. Even before the May 23 meetings, Bush was eyeing a confrontation with Iran as part of his revised strategy for remaking the Middle East. Bush was staring down Iran's hard-line President Mahmoud Ahmadinejad over demands Iran back off its nuclear research. By spring 2006, Bush was reportedly weighing military options for bombing Iran's nuclear facilities. But the President encountered resistance from senior levels of the U.S. military, which feared the consequences, including the harm that might come to more than 130,000 U.S. troops bogged down in neighboring Iraq. "Every other option, in the view of the nuclear weaponeers, would leave a gap," a former senior intelligence official told Hersh. "'Decisive' is the key word of the Air Force's planning. It's a tough decision. But we made it in Japan." By late April, however, the Joint Chiefs finally got the White House to agree that using nuclear weapons to destroy Iran's uranium-enrichment plant at Natanz, less than 200 miles south of Tehran, was politically unacceptable, Hersh reported. "Bush and Cheney were dead serious about the nuclear planning," one former senior intelligence official said. May 23 (Bloomberg) -- All seven people infected with bird flu in a cluster of Indonesian cases can be linked to other patients, according to disease trackers investigating possible human-to-human transmission of the H5N1 virus.